6 months old, and left to die. 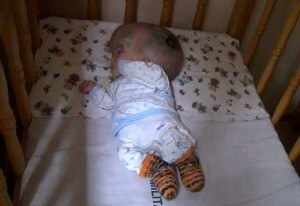 Several weeks ago, I visited a baby house in Eastern Europe. It houses about 130 infants and small children, a third of whom are children with disabilities. Most babies are eventually returned to their birth parents, put into foster care or are adopted. But not the babies with disabilities. They have nowhere to go. Among children with disabilities, almost 30% died last year. I walked with trepidation into each dark room. In the middle of the day, not a sound. Not one child crying. They learn quickly that no one comes. One room after another, children with disabilities lay dying. Hydrocephalus and spina bifida are left untreated, despite the fact that the country has the means to care for these conditions. I was told that doctors will not perform surgery on children with disabilities who “have no future.” And many die from lack of touch and love, despite adequate food and heat. One six month old baby with hydrocephalus still haunts my dreams. The condition (caused by a buildup of spinal fluid in the head) can easily be corrected by the insertion of a shunt. But instead, this little boy had a “burst” -his head blew a hole from the pressure. He lay in his crib dying an agonizing death. Millions of babies and children around the world are suffering the same fate-left to grow up in institutions without the hope of having a family. Many are denied medical care and left to die. We need to stop this. Segregation from society – or leaving children to die – is a fundamental violation of international human rights law and must not be tolerated in any society. That is why DRI is working towards the end of the institutionalization of children with disabilities worldwide. This can change: doctors and societies need to understand the value and human rights of every human being’s life; governments need to support families to keep their children with disabilities at home by providing financial support, inclusive education and respite care; and international donors, including the US government and the European Union, need to stop funding segregated services and more institutions to shut away children with disabilities. Children with disabilities have the right to grow up with a family and live as part of society – just like other children. DRI is training disability activists, educating international donors, getting the word out to the media, and holding governments accountable for human rights abuses worldwide. Please click here to make a contribution to support our work. We need your help. We really do. Warmest regards and much love.